2004. 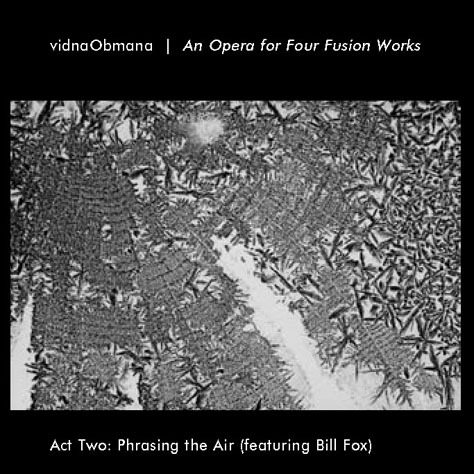 Act II of VidnaObmana's series AN OPERA FOR FOUR FUSION WORKS is now ready! Remember, Act I was released in a four-CD case, and acts II through IV are sold in a simple paper sleeve (with booklet) to be inserted into the Act I case. "Eargerly expected and now available is the 2nd chapter in VidnaObmana's ambitious Opera for Four Fusion Works. Act II : Phrasing the Air centers around the soprano saxophone, brilliantly played by American natural Bill Fox. What follows is a beautiful fusion of honest sax harmonies, multi-layers of recyclings and a collection of haunting themes. An album which differs immensely from Act I but simultaneously utilizes the same approach. A very unique recording which isn't that experimental than most of vidna's recycling works are but one that focuses more onto the aspect of harmony and atmosphere. A very unique recording and now available. Remember that it comes only in a simple sleeve holding the CD and booklet to insert yourself into the 4CD box-set supplied with Act I : Echoes of Steel. Separately available now but if you don't have Act I : Echoes of Steel yet, you can now order them together in the 4CD box-set as well. Dive deep into VidnaObmana's world of recycling." "This release from 2003 offers 62 minutes of quasi-classical ambience. Accompanying Vidna Obmana's electronics, guitars, bowed strings and infinite recycling on this recording is Bill Fox on soprano saxophone. Taking the concept of "drone" to new levels, this music has an eternally expansive sound. The tonalities and textures flow like unbridled liquid; unfettered by gravity or inertia, they seek to fill space with their pensive disposition. The air transforms into a roiling essence, ethereal yet substantial in its shadowy presence. It's as if thought has spilled out of the mind to take on vaporous form. Ebow guitars and bowed strings generate the impression of an orchestral mien, distant and ghostly in its definition. Emulating a buzzsaw whose growl has been elongated until it loses its aggressive outcry and adopts a more passive euphony, these treated strings become a fundamental element that unifies man and atmosphere. Predominant amid these soundscapes is Fox's saxophone. Treated to become a seamless horizon of sound, the horn's call forms impressive cloudbanks of moaning resonance. This sonic overcast blocks all light and silence, shrouding the landscape with serene moods that evoke an eternal dusk. Pulsing notes are contorted and folded back onto themselves, creating a pastiche of eerie quality. This music offers a dense ambience that embodies dark demeanor with celestial optimism. It achieves this state with classical instruments swimming in a pool of electronic treatments. The electronics are actually secondary to the traditional instruments, used to transform rather than immerse.